Our patented High Density Vertical Growing System presents a sustainable solution for urban cities worldwide by radically changing the way produce is grown, transported, and consumed. Ed Horton, President and CEO of Urban Produce LLC, announced today that Urban Produce will begin to license its patented High Density Vertical Growing System (HDVGS). Urban Produce is a Controlled Environmental Agriculture (CEA) grower in Irvine, CA specializing in “living”, organic leafy greens. Its unique technology allows organic produce to be grown year round, while conserving water by creating its own filtered water through atmospheric water generation (AWG). “The interest in licensing our growing technology has been encouraging and a blessing” states Ed Horton, President & CEO of Urban Produce. In the past six months, we’ve had agricultural leaders from three different countries visit our vertical farming facility." Urban Produce’s flagship vertical farm in Irvine is the first of many. Founded in 2013, the indoor vertical farm efficiently grows organic produce in a controlled environment. The new licensing model will have a footprint of approximately 3800 sq. ft., and can produce thousands of pounds annually, depending on what is grown. Each growing unit will be synced with an Atmospheric Water Generator (AWG) that produces ample water daily. Urban Produce headquarters are located in Irvine, CA. Interested licensees may email info(at)urbanproduce(dot)com for more information. Urban Produce is a Controlled Environmental Agriculture (CEA) vertical grower located in Irvine, CA. 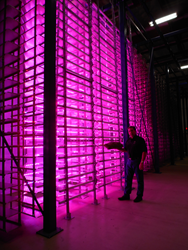 Their patented “in-motion” High Density Vertical Growing System allows them to produce live, organic, non-GMO produce year round. Their mission is to globalize locally grown, organic produce, thus stimulating economies and creating local jobs all while reducing agriculture's carbon footprint. Urban Produce's patented High Density Vertical Growing SystemHanging carriers of organic produce serpentine around the Urban Produce's indoor growing unit on a conveyor belt.